BERLIN ― Lockheed Martin executives Thursday dismissed critics’ claims that a German move to buy the F-35 fighter jet now would jeopardize future German-French combat aircraft cooperation. Jack Crisler, vice president of business development, argued the U.S. defense giant’s product would be “complementary” to plans for future aircraft to be developed initially by Berlin and Paris. “I don’t see it as competition,” he said. Speaking to reporters at the Berlin Air Show, Crisler said operating the fifth-generation jet would give the German Air Force a taste of the types of technology to come, which could be helpful in making the generational jump later. Company officials sought to frame the contractor’s response to a German request for information as a sheer business matter, independent of any political sensitivities surrounding the U.S. defense giant’s move toward the German market. However, the playing field is anything but apolitical. Outgoing Air Force chief Lt. Gen. Karl Müllner reportedly was considered too outspoken by Defence Ministry leaders in his openness for the F-35, previously noting the stealth and standoff combat capabilities as desirable features for the service. But Berlin officially favors an upgraded version of the fourth-generation Eurofighter ― built by a consortium of Airbus, Leonardo and BAE Systems ― as a replacement for the 90-strong Tornado jet fleet. The main argument is to keep European companies involved in building combat aircraft and, perhaps even more importantly, staying clear of disturbing Franco-German momentum in armaments cooperation. Airbus Defence and Space chief Dirk Hoke told the Welt am Sonntag newspaper over the weekend that if Germany picks the American F-35, it would upend plans for the European co-development of a new-generation aircraft that would begin service sometime in the 2040s. Crisler said Lockheed is working toward a per-unit cost of $80 million by 2020, at which point the global fleet will be roughly 50-50 in U.S. and international users. Company officials now aim to lower F-35 sustainment costs. “We realize that the cost of ownership is a significant part of the aircraft,” Crisler noted. U.S. Air Force Capt. 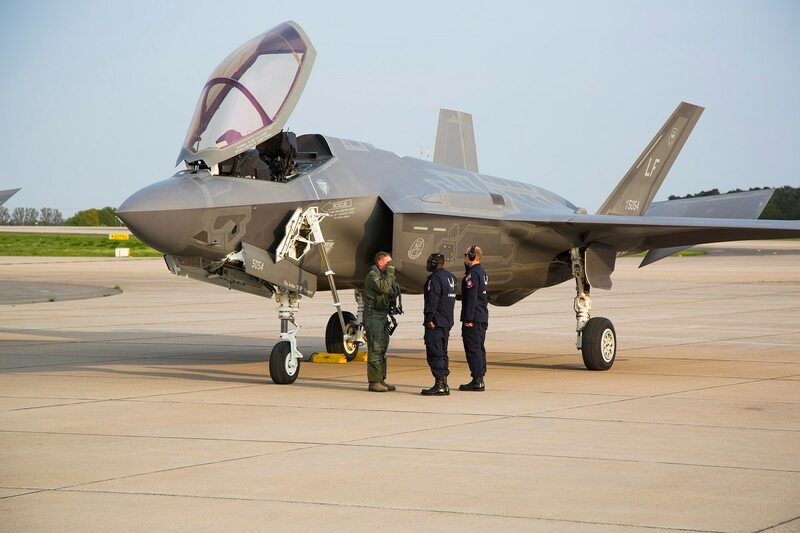 Andrew Olson, who flew one of two F-35A aircraft from the United States to Germany, praised the advanced capabilities of the jet. The sensor package automates many tasks that were previously manual, such as those related to targeting, he said. But he added that fourth-generation planes still have their place in combat scenarios for their ability to “put a lot of iron on target,” as their load capacities aren’t constrained by the limitations of stealth designs. The F-35′s role, he said, is to sneak into enemy airspace undetected, “kick down the door” and allow other aircraft to stream in safely. Besides the Eurofigher and the F-35, the Boeing-made F-15 and F/A-18 also are possible picks for what Berlin considers a bridging solution until a sixth-generation weapon is developed.